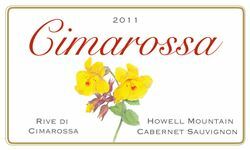 Cimarossa, meaning “red hill top”, is one of Howell Mountain’s most scenic estates, with terraced vineyards and olive groves climbing the hillsides. Located at 2100 feet elevation on the top of the Vaca range, the eastern mountains of the Napa Valley, Cimarossa is ideally situated to produce world-class wine and olive oil. The vines and olive trees are tended by hand, a labor of love that is evident in the quality of the products. The vineyards on the estate produce a rich yet elegant Cabernet Sauvignon of limited production, while the olive trees produce an extra virgin olive oil of superior quality.